Agrimony has had an important role in folklore traditions throughout the world. Its uses vary from soothing rashes and stopping bleeding to alleviating diarrhea. Common name(s)Agrimony, common agrimony, church steeples, cocklebur, church steeples, liverwort, philanthropos, sticklewort, stickwort. Agrimony is a medicinal herb with a long history of healing uses. Thought to be originated in Asia and Europe, it grows widely in western United States and parts of Africa. It possesses many medicinal benefits and is still considered a valuable plant in herbalism. Relieving inflammatory pain. Agrimony encourages blood flood, which reduces swelling and pain. Soothing skin irritation. Due to its anti-inflammatory properties, agrimony is particularly useful for treating burns, rashes, and hemorrhoids. Speeding wound healing. The astringent properties of the herb help prevent excessive bleeding, allowing for a fast recovery of damaged tissue. Agrimony has been traditionally used to treat diarrhea, soothe sore throats, and to stop bleeding. 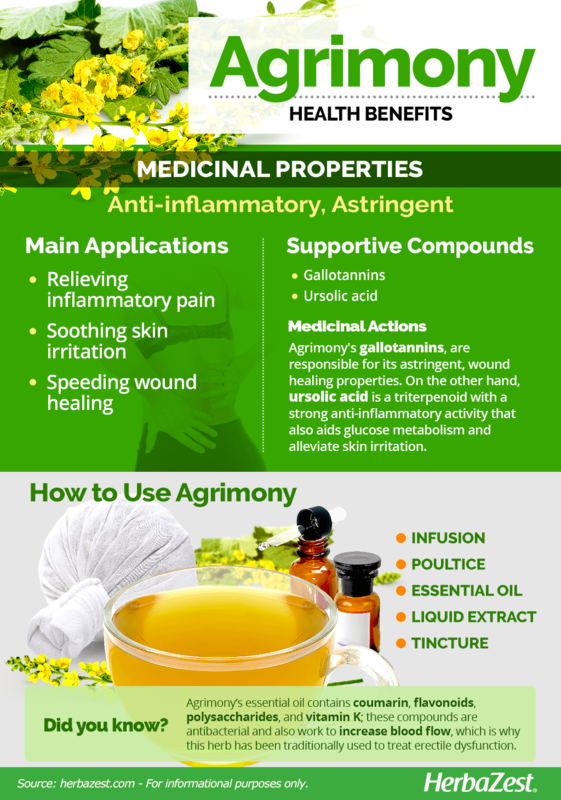 The main benefits of agrimony can be attributed to its high tannin content, in particular gallotannins, which are responsible for its astringent, wound healing properties. Second in importance is the presence of ursolic acid, a triterpenoid with a strong anti-inflammatory activity that also helps with glucose metabolism. Agrimony volatile oil also contains coumarin, flavonoids, polysaccharides, and vitamin K. In addition, some of the compounds present are also antibacterial and work to increase blood flow, which is why agrimony has been used in the past against erectile dysfunction. Horse chesnut and mallow also help reduce inflammation, and both have similar astringent benefits, while ginkgo improves blood circulation and, along with ginseng, it is thought to be useful in the treatment of erectile dysfunction. Although agrimony is safe when taken in therapeutic doses, people with pollen allergies may experience adverse reactions when in contact with this herb, including skin rash, itchiness, sneezing, congestion, and fatigue. 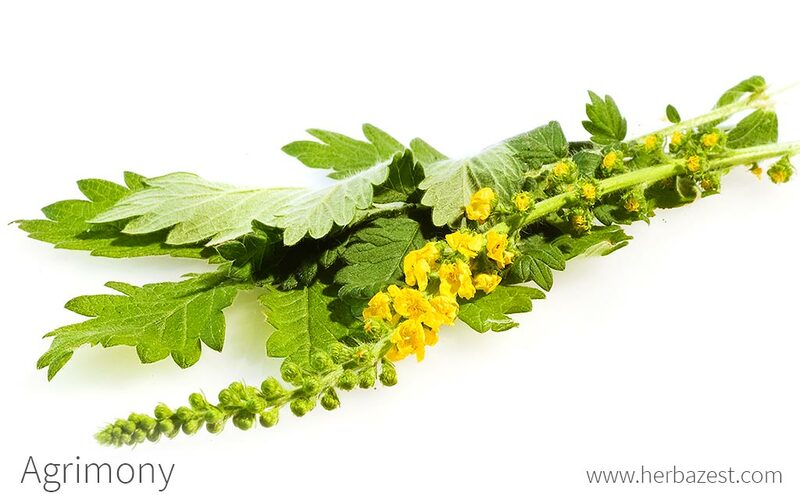 When using agrimony in therapeutic doses, its is advised to avoid direct sunlight, since the herb increases skin sensitivity. Agrimony must be avoided altogether during pregnancy and lactation. The upper parts of the agrimony plant are used in medicinal preparations. Because this herb is not widely produced or processed commercially, agrimony preparations are typically homemade or made by herbalists and are not often standardized. Infusion. The fresh or dried leaves of agrimony can be brewed to aid digestive problems. It is thought that a foot-bath with agrimony infusion can relieve minor muscle tension. This preparation can also be gargled in order to clear the voice and treat throat infections. Poultice. The crushed parts of the plant can be wrapped in gauze bandages and applied topically in order to prevent infections and speed up wound healing. Essential oil. Extracted from all parts of the plant, agrimony oil is meant for topical use. Its astringent, antibacterial properties help healing wounds and reduce bleeding. Liquid extract. Obtained from a distillation process, agrimony liquid extract is alcohol-free and concentrates the antibacterial action of the plant. Tincture. The upper parts of agrimony are macerated in alcohol to obtain a concentrated solution. Few drops need to be diluted in a glass of water in order to reap the medicinal benefits of the herb. Agrimony is a wild herb that can be found growing naturally in open areas, woods, and roadsides. The dried upper parts of agrimony are also available year round at most specialized herbal stores. Medicinal preparations of the herb, such as liquid extract and essential oil, as well as capsules are commonly available at most specialized health stores, and can also be purchased through online retailers. Agrimony is a low-maintenance herb for those who do not have a lot of time to tend to plants. It grows easily from seed in most areas and does not require a lot of water. Agrimony prefers full sun, but it still thrives in partial shade. The optimal soil for growing agrimony is light and well-drained with a pH of 6.0 - 7.0. Agrimony plants are best grown 6 - 16 inches (15 - 40 cm) apart, and sown one inch (2.5 cm) deep. Germination usually takes 12 - 24 days. Once harvest time arrives, leaves should be cut off before flowering, and then left to hang until dry. Pests or diseases are not usually a concern, although powdery mildew can appear if excessively irrigated. Agrimony plants are erect, downy, aromatic perennials with slender spikes. Agrimony plants grow up to three feet (1 m) tall and have paired leaves, small yellow flowers, and tiny, hooked seeds that attach to animal fur to spread. Agrimonia eupatoria is a member of the Rosaceae family, which contains approximately 2,830 species of herbaceous, flowering plants, including apple (Malus domestica), apricot (Prunus armeniaca), blackberry (Rubus fruticosus), blackthorn (Prunus spinosa), and cherry (Prunus spp.). Agrimonia pilosa and Agrimonia procera are very similar to Agrimonia eupatoria and are used interchangeably for medicinal purposes. Agrimonia pilosa is often used in China to treat diarrhea and stop bleeding, and is still used in trauma and surgery in some Chinese hospitals. There are around 15 species of Agrimonia in the United States. Agrimony gets its genus name from the Greek word agermone, meaning "healing to the eyes." It species name, eupatoria, is from Mithridates Eupator, a Pontus king famous for his profound knowledge of plant lore and his invention a complex "universal antidote" against poisoning. In Ancient Greece, agrimony was used to remedy ailments of the eyes, and is it also well known in traditional Chinese medicine as a natural remedy for menstrual discomfort. According to folklore, agrimony was used by witches to ward off hexes. Practitioners of voodoo also used it as protection to repel jinxes and banish negative spirits - it agrimony was believed to protect against spells and sends curses back to the originator. During the Victorian era, agrimony flowers were used to express gratitude and appreciation. Aromatic spices form a significant part of the exportation industry worldwide, estimated in 2012 at a value of $1.6 million USD. Particularly in southern European countries, agrimony contributes greatly to that end. Spain leads the way in its production, generating 90% of the world's supply of its essential oil, though France, Italy, and Bulgaria also benefit from the industry. Fresh leaves and stems are desired for culinary purposes, but the distilled oil made from these parts has proved more economically fruitful. Agrimony is often used as a dye, yielding a yellow hue. The shade depends on when the plant is harvested, ranging from dark to pale yellow. The tannins in agrimony have traditionally made it useful for processing leathers as well.